SOL INVICTUS holiday (Saturnalia) eyeshadow collection- retiring on 1/15/15! In ancient Rome, the Saturnalia festivities had a tendency to go on and on and on… but in this day and age, our sparkly Saturnalia celebration will be seasonally retired on 1/15/15. The collection will be back next holiday season. If you haven’t shopped this collection yet, or you want to pick up some full sizes SHOP HERE! SOL INVICTUS Holiday 2014 collection is releasing this Saturday! Check out the new swatch grids and updated descriptions! I hope to have some blogger reviews and swatches to share with you soon! Edit- Just in, this review and awesome swatches from Artistic Shadows! Opalia was a festival held during Saturnalia, on December 19th to honor Saturn’s consort, Ops. “The ancient Roman fertility goddess Ops was known by several different names—among them Rhea, Cybele, Bona Dea, Magna Mater, Thya, and Tellus. She married Saturn and was the mother of Jupiter, and was usually portrayed as a matron, with a loaf of bread in her left hand and her right hand opened as if offering assistance. The Opalia was observed on December 19, when it is believed that a sacrifice to Ops was made in the temple of Saturn. Color Description: A delicate opalescent pink with bountiful pink to blue color shift. This color would be a perfect shade for highlighting the brow, or even on the cheeks or to add shimmer to the lips!Shown swatched over NYX cream eyeshadow base and photographed under a daylight lamp. Color Description: An exquisite shimmering peach with oodles of icy blue, pink, copper and gold color traveling sparkles. Shown swatched over NYX cream eyeshadow base and photographed under a daylight lamp. This color is Vegan and Lip Safe! This color is “SIGILLARIA”. The day of Sigillaria was a day for exchanging little gifts. Unlike today’s lavish gift-giving of the season, the Romans exchanged small tokens of affection, such as little clay figures, beeswax candles, dice or other small, non-costly items. The most common gift on Sigillaria (December 23) was Sigillaria, which were specifically small clay or wax figurines. It is believed that this tradition stems from more ancient agricultural festivals, which involved human sacrifice. The act of exchanging Sigillaria is seen today in our tradition of gingerbread man cookies! So this holiday, when you eat a figurine-shaped cookie, recall the ancient Romans and their day of little gifts. Color Description: A gorgeously rich amber which is slightly metallic and having a spectacular amount of strong aqua and fuchsia sparklies. Shown swatched over NYX cream eyeshadow base and photographed under a daylight lamp. This color is Vegan and Lip Safe! Sol Invictus is the namesake color for the collection. It means “invincible sun” in Latin, and this was the overall nature of the Saturnalia revelry- a Winter Solstice celebration. The Winter Solstice being the shortest day of the year, which marks the point at which the sun is “reborn” and days become longer. Saturn was also an agricultural God, so this time of year for the Romans marked the point at which their Fall plantings were being sown, while others were being harvested. Color Description: A beautiful coral/orange shade with a slight golden undertone in certain lighting, bedazzled by color traveling orange-violet-fuchsia shimmer and bright green sparks. Shown swatched over NYX cream eyeshadow base and photographed under a daylight lamp. This color is Vegan and Lip Safe! Lua was Saturn’s consort, identified with Lua Mater, “Mother Destruction”, a goddess in whose honor the weapons of enemies killed in war were burned, perhaps in expiation. Saturn’s chthonic nature connected him to the underworld and its ruler Dis Pater, the Roman equivalent of Pluto, who was also a god of hidden wealth. Color Description: A heathered deep indigo/violet (will change from more blue to more violet depending on your viewing conditions) with dominant blue to teal sparkles that color shift to fuchsia/red. Shown swatched over NYX cream eyeshadow base and photographed under a daylight lamp. This color is Vegan and Lip Safe! The Lord of Misrule was the “Saturnalia Princeps”, or master of ceremonies who participated in capricious behavior, practical jokes, chaos and absurdity, similar in concept to the medieval Feast of Fools. Color Description: A gorgeous taupe base with really strong orange-red-violet color traveling iridescence. It’s a neutral with an amazing, shimmery twist! Shown swatched over NYX cream eyeshadow base and photographed under a daylight lamp. This color is Vegan and Lip Safe! “Io, Saturnalia!” was a salutation commonly heard during conversation during the holiday, much like our “Happy Holidays” or “Merry Christmas”. While Saturnalia was a very colorful and festive celebration, the main colors were blue and gold- which is the basis of this shade. Color Description: A smooth rich teal blue with prominent gold/copper/red color traveling sparkles. Shown swatched over NYX cream eyeshadow base and photographed under a daylight lamp. This color is Vegan and Lip Safe! Aureum means “golden age” in Latin, relating to the reign of Saturn as being a bountiful and peaceful era in history. Color Description: A richly shimmering soft warm gold with color traveling sparkles of gold/green and red/violet. Shown swatched over NYX cream eyeshadow base and photographed under a daylight lamp. This color is Vegan and Lip Safe! Even if you don’t know much about Saturnalia, mere mention of it brings to mind a week of ancient Roman style partying and debauchery. But that’s not all that it was about… It was an occasion for giving thanks for bountiful harvest (Saturn was an agricultural God), as well as the winter solstice- the return of the invincible sun. Social order was reversed, there were large public banquets, and it was a time of gift-giving, song, dance, time off from work, and overall, joyous merry-making! Color Description: A gorgeous berry shade that shifts to a softly metallic copper, with brilliant iridescent fuchsia and blue sparkles and copper iridescence. Shown swatched over NYX cream eyeshadow base and photographed under a daylight lamp.This color is Vegan and Lip Safe! Topsy Turvy signifies the aspect of the ancient Roman Saturnalia festival which involves the upending of the regular social order. Slaves acted as free men/women, donning the red pileus cap during the celebrations. Social order within the family might also be changed up, between children and parents, and likewise. It must have been an interesting time, in a culture with such strict social hierarchy, for masters to be serving slaves, and participating in activities they normally could not. 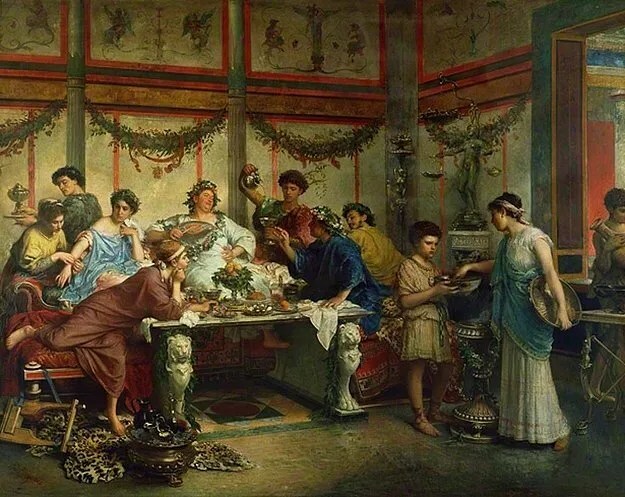 During Saturnalia, the Romans decorated their homes with clippings of laurel branches, and what holiday collection would be complete without a beautiful, sparkling green shade? Even if you think you can’t wear green eyeshadow, you’ll want to sample this one- the color-shifting chromatics make this shade appear differently depending on angle of viewing and lighting. It’s quite surprising! Color Description: A gorgeous multi-dimensional festive green with amber metallic lowlights and color-shifting highlight sparkles that keep this color ever-changing. Shown swatched over NYX cream eyeshadow base and photographed under a daylight lamp.This color is Vegan and Lip Safe! Luxuriae Maniae translates to “luxury to debauch”, which is in part one of the most historically well-known aspects of the Roman Saturnalia. Social roles were reversed, as slaves enjoyed some of the luxury and privilege usually only known to freeman. The typical Roman uniform of the toga was cast aside in favor of extravagant, colorful clothing known as “synthesis”. Color Description: An imperial purplish mauve with chestnut tones and a strong and sparkling color traveling duochrome effect that ranges from gold, bronze and copper. Shown swatched over NYX cream eyeshadow base and photographed under a daylight lamp. This color is Vegan and Lip Safe! Munera represents a darker side to the ancient Roman’s celebrations of the time. Munera were gladiator offerings that would coincide with the Saturnalia celebrations. These gladiator events, ten days in all throughout December, were presented mainly by the quaestors and sponsored with funds from the treasury of Saturn. Color Description: Aa rich taupe-y shade with brilliant aqua/gold/copper sparkles. If you foil this color, or rub it in to your lips or cheeks, it also leans to the rosy side! Shown swatched over NYX cream eyeshadow base and photographed under a daylight lamp.This color is Vegan and Lip Safe! Exclusive sneak peek Holiday 2014 samples being included in orders! More details in post! Exclusive sneak peek samples from our Holiday 2014 collection “SOL INVICTUS” started shipping out in orders on 10/27… from that date, they be included in the next 120 orders to ship (clearance site orders not included- only orders at aromaleighcosmetics.com). We’ve got ten samples each of all twelve shades packed up to share with you as sneak peeks. Official collection is mid-November so this is way ahead of our release date! Order volume has been very, very low the last 4-5 days, so if you place an order in the next week, odds are extremely high that you will be receiving one of these special samples! Upcoming Holiday 2014! “SOL INVICTVS” Saturnalia-themed luxe limited edition eyeshadows! Just a little heads up! Before you know it, the winter celebrations will be upon us. This collection will be ultra limited edition, using some jaw-droppingly beautiful new multichromatic high shimmer pigments. Follow us on FB, Twitter, Pinterest, Instagram, Tumblr or our blog to get updates about this beautiful upcoming set!